We are not a recruitment agency. You will never be charged a "Finder's Fee" to contact applicants. Tendo Jobs is a tool for in-house HR managers. The pricing is what you see. Nothing hidden. Revolutionise your recruitment with Tendo Jobs by connecting directly with job hunters in a fully transparent way. By cutting out the traditional costs associated with recruitment, this saves a significant amount of money which allows you to offer higher salaries and attract higher calibre candidates. Traditional recruitment is tough for employers. With low numbers of job hunters finding the job listings on your own website, paying for job adverts on multiple websites on the off-chance a good candidate applies or paying a large portion of the annual salary to recruitment consultants. There is no ideal solution from these options. That’s why Tendo Jobs exists. To link you as an employer directly with job hunters in a no-risk, low-cost, fully transparent and cost-effective way. It's time to revolutionise your recruitment by using an online platform which joins everything together. A few of our latest registered employers on Tendo Jobs. Join the recruitment revolution with your free account now. Zero risk strategy for recruiting your next candidate. Everything is free until you want to pay. No more smoke and mirrors with recruitment. Allowing job hunters to apply directly with employers. Designed to scale as your business grows. Global reach for free. We market your jobs to ideal job hunters so you can fill your vacancy with ease. Post all your vacancies for free at Tendo Jobs, no matter what subscription package you are on. Review job applications for free at Tendo Jobs. Subscribe to the package which suits your needs most. Secure cloud based technology with SSL and database encryption technologies as standard. Keeping your data safe is our priority. Access your job listings, candidates and more from anywhere in the world. Fully secure with our cloud based technology. Manage applicants online through our cloud based technology. Track the progress of your job vacancies with ease. 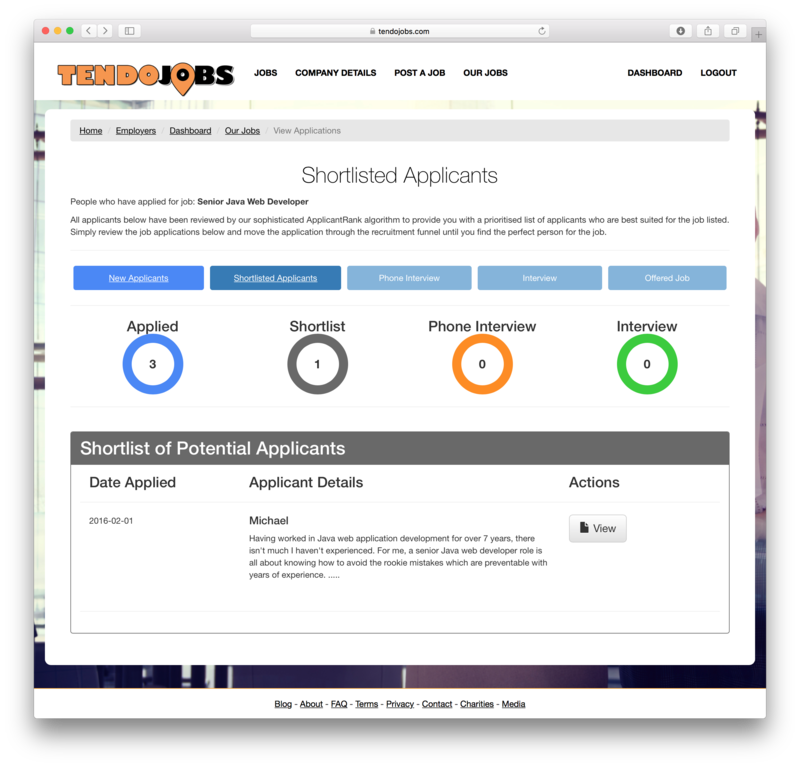 Shortlist applicants for interview to allow you to easily sort through applications. Invite candidates to phone interview through our applicant tracking system with ease. Invite candidates to interview through our applicant tracking system with ease. Talk with candidates at every stage of the process with our applicant tracking system. Securely subscribe to the subscription package of your choice which suits your needs. All job applications are run through our sophisticated ApplicantRank algorithm which sorts the wheat from the chaff so you don't have to. Fully responsive technology, meaning you can access on your desktop computer, laptop or mobile phone from anywhere in the world. Keep track of your vacancies with ease. Industry leading recruitment technology designed to link Employers directly with Job Hunters with ease. The Tendo Jobs recruitment platform is designed to make life as easy as possible for employers to recruit their next candidates. Unfilled job vacancies leads to slower growth within the company. Below are a selection of the tools and features available on Tendo Jobs within the different pricing plans. Free! That's right, it's completely free to post your job vacancies on www.tendojobs.com. Get your job vacancy in front of active job hunters to increase the number of applications you generate. Find the perfect candidate for you vacancy when you post your job for free. As job hunters apply for your vacancies, you can review the applications and contact details straight away with no kind of "Finder's Fees" that you may be used to paying. This allows you to see how well suited the job applicants are for your vacancy before inviting them to interview. To make your life even easier as an employer, we run all applicants through our sophisticated ApplicantRank algorithm which will automatically rank high calibre candidates towards the top and filters out applicants who do not have the right skills, knowledge or experience for the job. No-one likes reading through hundreds of applications, which is why we aim to make your life as an employer as simple as possible. Within your Employer Dashboard you have access to a full applicant tracking system which is designed to allow you to manage your whole recruitment process through Tendo Jobs. This includes inviting candidates to phone interview, to an actual interview, offering candidates the job or letting candidates know why they haven’t been successful. The streamlined applicant tracking system allows you to easily keep track of how candidates are progressing through the recruitment funnel. With smart reporting technologies you can visualise this process with ease. When you subscribe to one of the paid plans on Tendo Jobs, you have a branded careers page created for you automatically which is viewable on the Tendo Jobs website. You can access your own branded careers page through your Employer Dashboard. As job hunters are browsing around Tendo Jobs looking through vacancies, your branded careers page is linked to from your job listings to encourage job hunters to review all of the jobs you have available and apply. Your branded careers page on Tendo Jobs is included in your paid subscription plan for you to use and promote as you wish and the page will be automatically updated to reflect your company description, current vacancies and company logo. 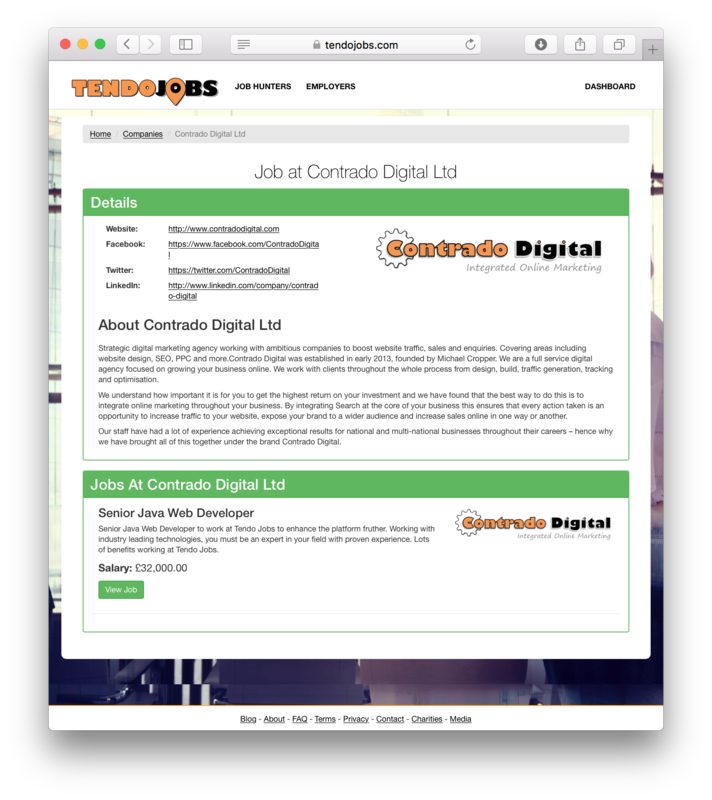 That's right, you can have your entire careers page on your own website powered completely by Tendo Jobs! No more time required asking IT to add another job vacancy to the website or to remove an outdated one or to tweak a bit of text. 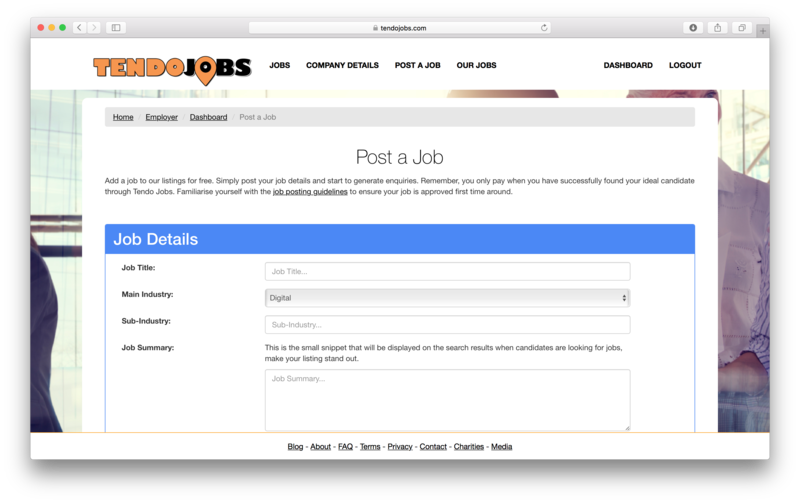 Simply embed the Tendo Jobs Branded Careers Page Widget into your own website with only 4 lines of code, a quick copy & paste job and you're good to go. Whether you want to embed your branded careers page on your website at https://jobs.your-website.com or at https://www.your-website.com/careers/ there are widgets to support this. Worried about site speed? Don't be. We test our systems on a regular basis for performance through independent site speed testing tools and have found that the Tendo Jobs Branded Careers Page Widgets will load on your website in less than 200 milliseconds on average, i.e. less than 0.2 seconds which is faster than 99.9% of websites the independent tool has tested. Super fast and super slick. Want to take your Tendo Jobs platform to the next level and integrate this seamlessly with your own systems? Not a problem. For enterprise customers, get in touch to discuss your full requirements and find out how the Tendo Jobs API can integrate with your systems. Connect with our RESTful JSON API to pull and push data between the Tendo Jobs platform and your own systems. Full documentation and support is available along with your own technical lead at Tendo Jobs to support with your custom integrations. Tendo Jobs is designed to be as simple as possible to allow you to recruit staff for your vacancies with ease. Creating an account is as simple as can be, register as an employer now. Tendo Jobs is designed to connect employers directly with job hunters which is why we need to verify your identity to reduce spam. We generally review and authorise your new account within the hour. Once your identity as an employer has been verified, you're good to go. Posting your vacancy on Tendo Jobs is completely free to do. Yes, that’s right, free. We believe that employers should not have to pay on the off-chance that they find a suitable applicant for the job. That’s why you can post your vacancies for free on Tendo Jobs. There are several options for streamlining your recruitment process when using Tendo Jobs. Whether you are simply looking for a cost effective way to get your job vacancy in front of job hunters, or whether you are looking for your own company branded careers page embedded on your own website, Tendo Jobs has a solution.